There aren’t many good restaurants in San Leandro – and most of these are very expensive. Horatio’s may be the most expensive of these all, but they have discounts from time to time (including a buy 1/get 1 free dinner coupon that they e-mail you for your birthday, if you sign up with their club), so we go a couple of times a year. We love the location in the San Leandro Marina, it’s a great place to see the sun set. The food is generally good, but it can be inconsistent. We’ve usually had good experiences, but the same cannot be said of our some of our friends. Here I include the updates of the original review I wrote many, many years ago. Once again we went to Horatio’s for my birthday armed with one of those coupons. We got there around 7 on a Friday night and the place was rocking, fortunately we were able to sit in the lounge (at the last remaining table). Horatio’s has changed its menu somewhat, gone is the burger that I had the last few times, and added some smaller plates. Entrees continue to be very expensive, in the 20’s, for plates of food that are not particularly impressive. This time we skipped appetizers (their focaccia bread is great and I wasn’t super hungry) and went straight for the main dishes. I had the short ribs from the specials menu (~$26) and Mike had some fish. 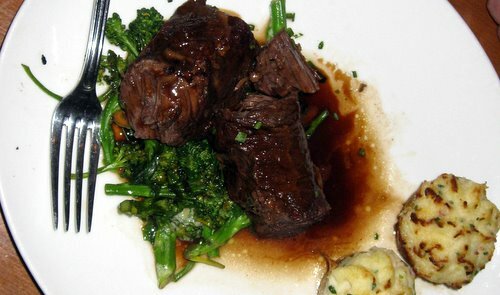 The plate of short ribs was rather plain, it consisted of two boneless short ribs without any braising liquid to speak of, some mashed potatoes and some broccolini. It didn’t seem like much food to begin with, but the short ribs were substantial and surprisingly lean. They were tender and juicy and quite good, but not really extraordinary. I’ve made better short ribs many times. The dish was fine, but not worth the price. The same can be said about Mike’s fish. This was a much less substantial dish, and while the fish was nice and flaky, the sauce was delicate and not very exciting. It came with some strange tubular vegetable that wasn’t too appealing. I think Horatio’s needs to put some more care into its side dishes. If instead of plain veggies, it provided something more interesting, the dishes might be worth the price. Service was great, however. Our waiter brought us a complimentary creme brulee dessert with a candle, which I thought was very sweet. Went back to Horatio’s last night with my friend Lola for dinner – we had a buy 1 entree, get 1 free coupon, which made it seem like a good deal. Alas, this time the food (but not the desserts) wasn’t that great, so it ended up not being a great one. I got the burger ($16) again, and this time it was very, very, very dry. It was huge as usual, though, and I ended up taking half of it home. Lola had the steak salad ($19), and she thought it was fine but not stellar. The chocolate indulgence cake was particularly good last night, so I can’t complain about that. Still, the food is so expensive that it should be great. Hmm, it may be that Horatio’s is becoming our place to go for birthdays and anniversaries. I actually didn’t want to go to Horatio’s this time (March 2010) – I had a giftcard for its restaurant chain I wanted to use, but I thought I’d enjoy Kincaid’s or Skates better. But they all have the same menu, and Horatio’s is just so much more convenient, specially we are in somewhat of a hurry to get our kids back from being babysat before it gets too late. So Horatio’s it was again, and we had a pretty good experience once again. That said, Mike felt that for the amount of money we paid, the dinner wasn’t special enough. Once again we shared the baked brie appetizer (just as good as always), which this time was served with just three, tiny, paper thin slices of apple – even though we asked the waitress to bring us more! I once again ordered the cheeseburger ($16), and was very happy with it. The burger had a real charbroiled flavor to it, and the bacon was delicious. It comes with some blue cream cheese that complemented without overwhelming. It was just great. The burger is a whole 10 ounces (I guess they feel they need to justify the price), so of course is too big to eat at one sitting. This time Mike was filled by his dish, so I took the rest home – surprisingly it was quite good microwaved the next day as well! I ordered it with onion rings instead of fries, and this time they were quite good. They had a subtle, sweet flavor and went well with the piquant dipping sauce. Of course, I couldn’t eat more than a couple – and was sad for that. They also came with mushrooms on the side – but these were cold. Indeed, the whole platter was luke-warm and was probably sitting around for a while. 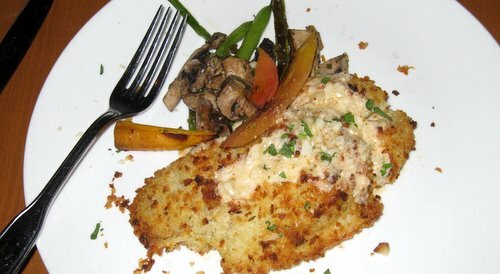 Mike had the special of the day, mahi mahi stuffed with crab. He thought it was very, very good and enjoyed every bite. He also had a margarita, which he thought was good and tasty, but a bit week. For dessert I ordered the lavender chocolate cake with vanilla bean ice cream on special ($8, I think). I was *very* disappointed. The cold cake had clearly been in the fridge for quite a while and had acquired that stale-like refrigerator flavor. The ice cream was delicious, but the cake was not worth the calories. The waitress was nice enough to replace it with a slice of their decadent chocolate cake, my favorite at Horatio’s, which I really enjoyed. The service was quite good, with the exception of the apple episode. In all, it was a good meal – but again, I wouldn’t go back unless I had a gift certificate of some kind. We went back to Horatio’s a couple of weeks ago (September 2009) to celebrate Mike’s birthday. If you join their mailing list, Horatio’s will e-mail you a $20 OFF coupon that you can use during your birthday month. Given how expensive Horatio’s is, we generally only go when we have that certificate. Once again, we had the warm brie appetizer, which was excellent though, once again, it was in need of more apple slices. I wish it was served with plain toast or even bread, while their focaccia is delicious by itself, it adds an element that the subtle cheese doesn’t need. I should also say that the portion is very generous, large enough for 3 or 4 people (but we ate it all). I had their burger, which I think costs something like $16, but comes with everything you can possibly want: the usual fixings, bacon, avocado, sauteed onions and even mushrooms, I think. It was a big burger, a pretty good burger and I enjoyed it. The french fries were unimpressive, but fine. Mike had the fish special of the day, some sort of white fish in some sort of white sauce. All I know is that enjoyed it a lot – but the portion was rather small. We didn’t have time for dessert, as we had to go pick up our kids, but we often have dessert at Horatio’s and we’re always pleased. A couple of nights ago, a friend took the kids over for a sleepover, and Mike and I decided to go out. I hadn’t been at home for our 15th anniversary (it was my last day in Kenya), so this was sort of a late anniversary dinner. This time I was not that impressed with Horatio’s. We ate at the lounge, which is my favorite area of the restaurant. I was in the mood for something sweet so I ordered the onion rings ($6) and the BBQ pork sandwich ($10). Mike had the fish & chips ($13.50) – all food from the pub menu. The onion rings were very disappointing, they barely had any flavor, though the dipping sauces were pretty good, specially the spicy one. Still, the onion rings and mayo sauce at Angelina’s are much better. My sandwich was advertised to come with coleslaw, and I assumed they meant on the side. Instead it was mixed into the meat, making it too spicy for my taste. Others, I’m sure, would like it. The sandwich came with a large portion of unremarkable fries. Mike’s fish and chips were good, and he’d order them again. I think I might as well. The portions were quite generous, and I wasn’t able to finish it all. Even so, I could not resist getting their chocolate decadence cake ($8), a chocolate cake with a deep fudge frosting served with vanilla ice cream. It really honors its name and it’s fully decadent. I love it and order it almost every time I go to Horatio’s. I’ll continue going to Horatio’s as I really enjoy the lounge and the desserts – and now that they have a pub menu, going there for dinner is less onerous (their regular menu is very expensive).